Does the human body have a resonant frequency? If so, how strong is it? Inspired by this question on Music beta SE, I'm wondering if the human body has a strong resonant frequency. I guess the fact that it's largely a bag of jelly would add a lot of damping to the system, but is that enough to dampen it entirely? 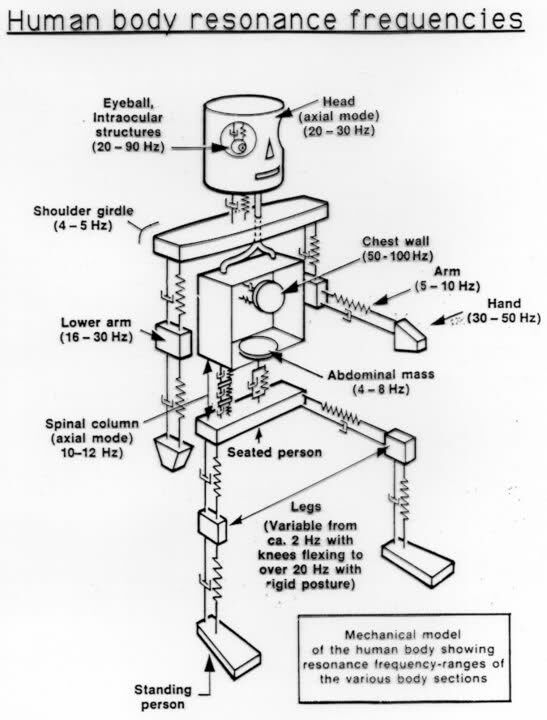 What models for resonance might be used to model the human body? (E.g. weight-on-a-spring, with legs as springs?) What about individual, semi-independent body parts, like legs, or lung cavity (acoustic resonance?). As for applications, I have heard that sub-audio frequency vibrations have been considered as nonlethal weapons for riot control. I have just noticed the question. Indeed, the body does have very clear resonances. Nature has prioritised speed of movement over stability so limbs are underdamped and naturally resonant. It is likely that many rhythmic movements occur at the resonant frequency of the body parts involved (rather similar to the oscillation of some insect wings). A complication is that, like many biological tissues, muscles are very non linear and are actually much stiffer for small displacements than for large ones. This means that, for example, the resonant frequency of the human wrist is about 2 Hz for large oscillations but rises to ~ 10 Hz for small ones. There is some physiological literature on this subject - my late colleague and friend EG Walsh described some of it in his book, Muscles masses and Motion (1992, CUP). More recently I have been very interested in the contribution of resonance to the small, normally unnoticeable tremor that all humans have. Have you heard of Royal Raymond Rife? To the best of my knowledge, he pioneered research into human frequencies and ended up developing a cure for cancer back in 1934! See for yourself: Google his name. Not the answer you're looking for? Browse other questions tagged acoustics frequency biophysics oscillators resonance or ask your own question. Why is AC more “dangerous” than DC? How could this person have discovered the resonant frequency from this string of magnets? How would natural (resonant) frequencies affect amplitudes? What really is the significance of the resonant frequency in terms of “ease of vibration”? Does human body have a centre of mass? Complex resonant frequency not resonant without imaginary part. So can I still just take real part as solution? Are resonance and resonant frequency the same? What does “relatively uniform resonant frequency” mean? What does resonant frequency in the Q factor mean?